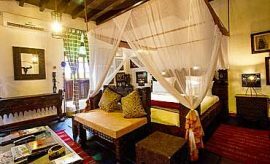 Just behind the Old Fort in the heart of Stone Town is one of Zanzibar’s premier accommodations — Jafferji House & Spa. 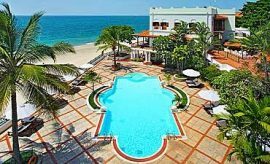 This AfricanMecca recommended boutique hotel features 10 individually-appointed theme suites to fit every personal travel style, from the guest who desires a journey into yesteryear to the music lover who wants to celebrate one of the world’s most talented musical artists. 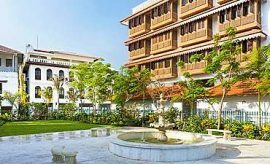 It took the owner of the accommodation, Javed, three years to restore this family home with the superlative standards and also antique décor from all regions of the olden days spice trade i.e. Morocco, Mozambique, Oman, India to Afghanistan. 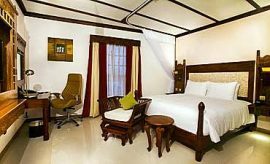 All of the rooms are air-conditioned and have modern amenities that you need for your ultra-comfy tour of Stone Town, including complimentary wireless internet, air-conditioning, 32-inch flat screen television, room slippers, his and her bathrobes, in-room telephone and safe. The largest are the five Signature Suites, including the Livingstone Suite that celebrates the work of Dr. David Livingstone, Mercury Suite that commemorates one of Zanzibar’s famous residents — Freddy Mercury, the Stanley Suite named after Henry Morton Stanley, Spice House Suite that is filled with the aroma of exotic spices and the quintessential Zanzibar Kabisa Suite that immerses you in the island experience. 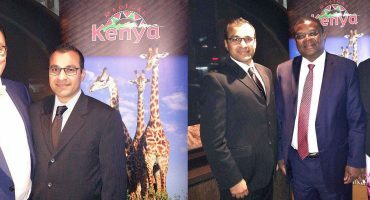 Three Superior Suites are also available, including Adnan, Out of Africa and Princess Salme’s Suite. Lastly, the two Superior Deluxe Suites offer an impeccable island holiday setting. 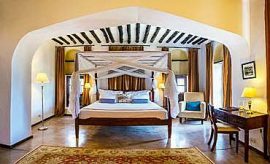 Jafferji’s Sultan Suite is the largest room in this premier hotel and exquisitely decorated to reflect the utmost island luxury. For a uniquely romantic experience, we recommend the Kama Sutra Suite that is specially designed to evoke passion and intimacy. The two-story suite is large enough to accommodate small families, but parents may wish to exercise caution when choosing the room as the décor may not be appropriate for children. 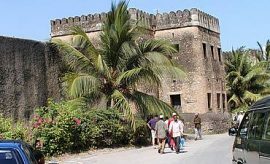 With the history and culture of Zanzibar just outside your door, you are sure to want to tour every nook and cranny of Stone Town and the surrounding attractions during your Indian Ocean island vacation in Tanzania – Eastern Africa. Jafferji House & Spa offers a lovely selection of coffees, teas and pastries at Café Miwa, and you may also choose from smoothies and juice made from fresh local fruits. You may then spend the remainder of your morning on a guided excursion. The walking exploration takes you to many of the island’s most desired sites, including a local market, Anglican Cathedral, Sultan’s Palace Museum (Beit-al-Sahel), home of Tippu Tip, Old Fort (Ngome Kongwe), Livingstone House, House of Wonders (Beit-al-Ajaib), Forodhani Gardens and Peace Memorial Museum (Beit-al-Amani). Return to Jafferji House for a gourmet lunch and other delights accompanied by flavored coffee and tea. Take a quick nap or partake of a spa treatment. 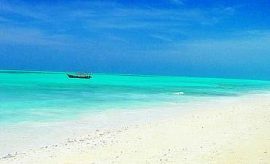 Rejoin with your AfricanMecca guide for an enlightening trip to the spice farms of Zanzibar where the air is heavily scented with exotic scents. Almost every inch of soil is covered with plants and trees that produce cinnamon, tangerines, nutmeg, lemongrass, cloves and much more! 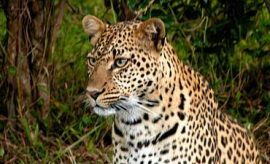 Your guide then takes you to Jozani Forest Reserve to observe tiny creatures nestled in the vegetation and trees. 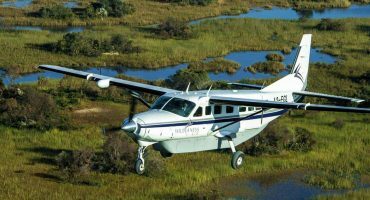 Some of the most well-known fauna are rare Kirk’s red colobus monkeys, Syke’s monkeys and Aders’ duikers. But peer close enough and you also see small reptiles, turtles, insects, butterflies, crabs and other smaller denizens. After your nature safari in Zanzibar’s forest, return to Jafferji for sunset cocktails and dinner of Swahili fusion cuisine at Mistress of Spices Lounge or Thai dishes at Lemongrass. 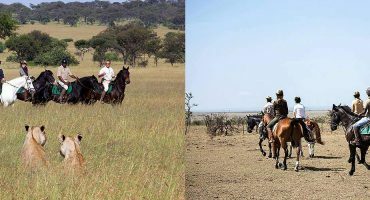 When tour vacationing at Jafferji House & Spa in Zanzibar, we recommend experiencing some of the surrounding Zanzibar Island attractions and tour activities after your Northern Tanzania safari to Tarangire, Lake Manyara, Ngorongoro Crater and Serengeti.